Jessica was referred to me by one of my favorite brides, Melissa. We had sent out her save-the-dates and now it was time for her wedding invitations. 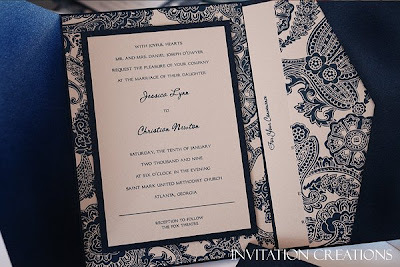 She wanted her invitations to keep with same theme as the save-the-dates which meant clean lines, no graphic to take your eyes away from the wording and more along the lines of a classic look. This was my first invitation, as was the case with the save-the-dates, that I didn't use any graphic or initial or icon. Ironically, this style is harder for me to design than ones with a lot of graphics. What I love about working with someone like Jessica, is the challenge is poses to me and my craft to think in a different manner. Jessica and her fiance also really wanted a custom map of their wedding and reception. Due to the location of it, being downtown Atlanta, they insisted that this was a necessity. At the time, I had never done a custom map and had refused previous requests of custom maps. At the meeting, I had told them the same, but if they wanted to provide a map I would happily print it on the back of their directions insert. Now, let me explain my excuse, uumm, I mean reasoning: I had never done one before, never tried and had no idea of what to tackle first. With my schedule as it is(super busy! ), I just didn't have the extra time to research maps or practice executing one. I surely didn't want to disappoint any client. So thus, the reason I had been turning down these requests. Jessica's fiance sent me a simple map with triangles and circles as icons. I should preface this statement with how amazing Jessica is about scheduling deadlines in advance, meeting deadlines, scheduling meetings with plenty of advance notice, etc. This attribute gave me plenty of time for designing and assembling all of her items. So, when I received his map, it was in a jpg. format and I knew once printed it would look a little blurred so I took the opportunity to improve on what he had started plus it was a great opportunity to give maps a try. Yes, custom maps do take a little bit of time, but I enjoyed it! It was a fun learning process and I do have to thank Jessica and Christian for not giving up on the request. It was my first custom map on the back of her directions insert. Jessica was also my first bellyband or what some call a sash. She liked the pocketfold look, but when it came to seals, she didn't like how they didn't lay completely flat. So, I created a bellyband which she really preferred which holds the pocketfold closed. Thanks, Jessica for letting me be a part of your special day!